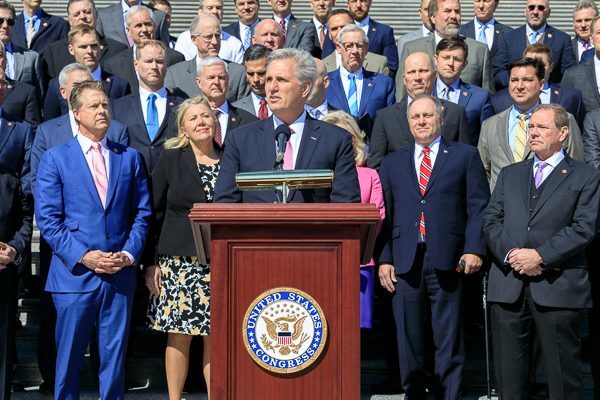 This morning, Republican Leader Kevin McCarthy (CA-23) delivered remarks on the House floor outlining the lackluster and ineffective first 100 days of the Democrat majority in the 116th Congress. Following his remarks, Leader McCarthy was joined by House Republicans on the steps of the Capitol for a “100 Days of Democrat Disappointment” press conference. “This Friday marks the 100th day of the new Democrat majority — 100 days of Democrat disappointment. “The numbers speak for themselves. At this point in the last Congress, Republicans had passed 141 bills out of committee and 132 out of the House. By contrast, Democrats have passed 68 bills out of committee and 97 out of the House. So much for doing the job of the People’s House. “As the majority, the Democrats have focused on three principles above all else — resolutions, radicalism, and resistance. One in five votes in this House that have been taken since the end of January were non-binding messaging resolutions. Just last week, we wasted time debating a symbolic resolution on health care. “Imagine for a moment if we had instead spent one-fifth of our time actually working to lower premiums, expand choice, or improve quality? Imagine all that we could have achieved. Right now we have a humanitarian crisis along our southern border. What if we spent one-fifth of our time working to improve border security? And fix the loopholes in our immigration system? “After spending weeks unwilling to condemn antisemitism, you would think House Democrats would rush to schedule real legislation. We have a bill sitting at the Speaker’s desk right now that would take concrete steps to counter the growing Boycott, Divestment, and Sanctions movement against our greatest ally in the Middle East — Israel. “You would think that after the Virginia governor made comments that seemed to support infanticide, House Democrats would rush to schedule the Born Alive Abortion Survivor Protection Act. “Today we were supposed to be voting on a so-called budget the Democrats proposed. But, they pulled the vote because they have allowed the Socialist wing of their party to overtake them. “Nancy Pelosi is famous for saying ‘show me your budget, show me your values.’ But today there will be no budget, and I question what their values are. “Later today, [House Democrats] will leave and go on their retreat. They invited celebrities, not to perform, but to tell them what the values of hard-working Americans are. “I have one question for the Democrats after their first 100 days: what have you accomplished? Name me one problem you have solved.